Native Mau Cats of Egypt are the oldest known descendants of Egyptian domesticated cats (which have provided a partial foundation for the recent Egyptian Mau cat breed), and they are one of only a few naturally-occurring, small, spotted cats in the world. However, Native Egyptian Maus are facing possible extinction. 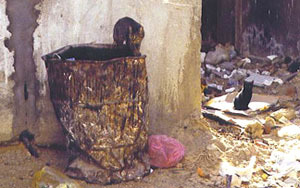 In their homeland, they are currently unrecognized, routinely poisoned, and often suffer from endemic feline diseases. Outside of Egypt, many Maus are also endangered due to interbreeding and lack of new bloodlines (see History). Formed in 2004, EMRO is officially registered as a non-profit charity in Egypt, an NGO (Non-Governmental Organization) with charitable number #6196 effective August 23, 2005. EMRO is dedicated to rescuing these descendants of the sacred cat of Ancient Egypt (see Who We Are). EMRO is an adoption agency both locally and internationally for tame Native Egyptian Maus. Adoptions are on a cost-recovery basis and by approved application. EMRO is not supported in any way by the government but exists solely through donations, vet clinic funds, private cat boarding, and through sponsorship of its cats. 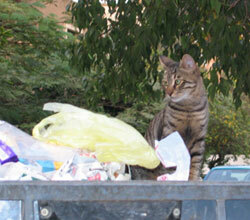 EMRO aims to increase education in Egypt and around the world about these magnificent and intelligent cats. To view articles about or involving EMRO, please go to the page titled "EMRO Articles", or click Here. Join EMRO on Facebook and Twitter! Plus, "Gloria's Rescue Cats"! As of June 2017, the EMRO Shelter, Clinic, and Boarding in Cairo, Egypt officially closed it doors. The EMRO Founder wishes to Thank all of our Donors, Adopters, Sponsors, Staff, Volunteers, Mau Friends, and all Supporters and Caring Individuals who have helped make EMRO what it is since 2004. Thank You ALL for your hard work, support, and caring! It is hoped that all of us have reduced the suffering of at least a few animals during the aforementioned years, while providing a livelihood for a few workers, while raising awareness of the plight of the Native Mau. The ongoing animal welfare work "torch" is now passed onto other NGO groups in Egypt and both we, and they, would be very grateful if you would provide them with your continued support. For more information, please feel free to contact the WebMauster at WebMauster@emaurescue.org. Thank you All for believing in us!